Please feel free to share this guide with others. If you are a librarian, you are welcome to use this guide and its contents for your own purposes. Thanks to KT Lowe, librarian at Indiana University East, for creating the original guide of which this one is based. Fake news = real advertising revenue. 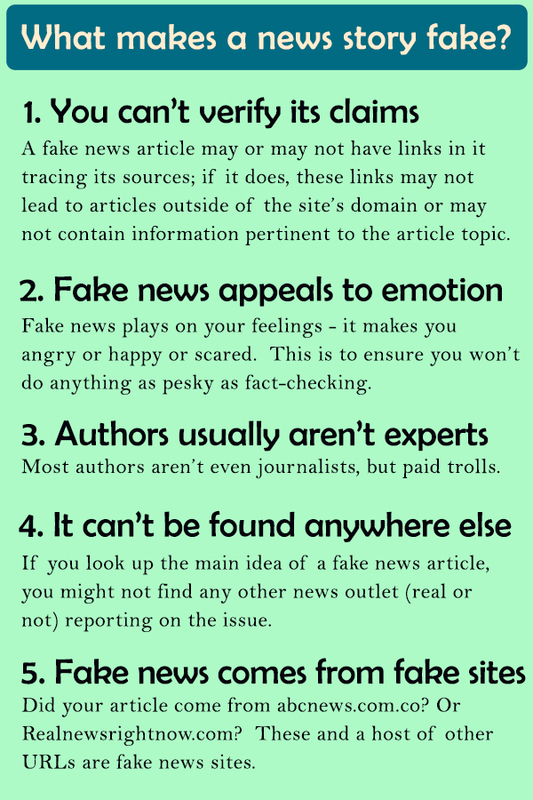 If people click on a link to a fake news website, they usually see some real advertising, which means money for whoever posted it and sold the ads. Listen to this interview with the guy who posted one of the big fake news stories of 2016. Today on the show, we take this single fake news story and follow the clues all the way back. We follow the digital breadcrumbs until we find ourselves on a suburban doorstep, face to face with the man behind a bogus news empire run. Then he tells us his secrets. I want to believe it, don't you? Is it real? What about when you search for the story on Google? What kind of fake news exists? So what? Why should you care about whether or not your news is real or fake?